Exposition of the global shock wave therapy device market can be attributed to increase in number of musculoskeletal disorders across the globe. 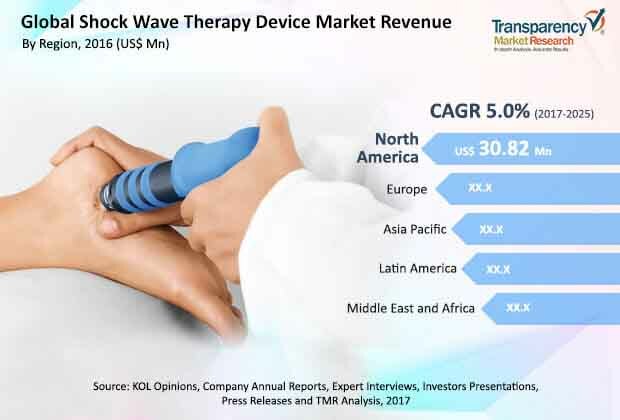 The global shock wave therapy device market was valued at over US$ 91.6 Mn in 2016 and is projected to surpass US$ 139.9 Mn by 2025, expanding at a CAGR of over 5.0% from 2017 to 2025. The global market is expanding at a considerable pace due to rise in digitization for pain management practices, high incidences of orthopedic surgery, occurrence of kidney stone among geriatric population, erectile dysfunction in men, and surge in demand for analgesic free treatment procedure. Shock wave therapy device is an administrative and clinical tool that helps improve the treatment efficiency of kidney stone. The lithotripsy is the most common treatment used to target and break the stone in kidney into fragments. This system is also known as extracorporeal shock wave lithotripsy. The nonsurgical technique uses high-energy shock waves to treat kidney stones. The shock wave therapy device helps patients suffering from erectile dysfunction to improve the overall operational efficiency and patient care. High prevalence and incidence rate of erectile dysfunction, cardiac diseases, increase in number of cases of kidney stones, and orthopedic injuries across the globe have increased patient flow to private clinics and hospitals. These factors are projected to increase demand for shock wave therapy devices in the near future. Additionally, technological advancements such as combined shock wave therapy integration facilities with other electronic probes, and laser technology is expected to fuel the shock wave therapy device market during the forecast period. The global shock wave therapy device market is broadly segmented into application, modality, end-user, and region. In terms of technology, the global market is categorized into focused shock wave generation, radial or ballistic shock wave generation, and combined shock wave generation. The focused shock wave generation is sub-segmented into electromagnetic shock wave generation (EMSG), electrohydraulic shock wave generation (EHSG), and piezoelectric shock wave generation (PSG). In terms of revenue, the focused shock wave generation segment accounted for a key share of the global market in 2016, the radial or ballistic shock wave generation segment is anticipated to expand at exponential growth rate during the forecast period. The segment is estimated to gain significant share of the market share by the end of 2025. The radial or ballistic shock wave generation offers several advantages over the focused shock wave generation and thus, radial or ballistic shock wave generation is gaining popularity among orthopedic and urologist physicians. Based on application, the global shock wave therapy device is segmented into orthopedic, cardiology, erectile dysfunction, urology, and others. The orthopedic and urology segments dominated the global market and this trend is likely to continue by the end of 2025 with marginal increase in its market share. Increase in adoption of pain free treatment procedures by the younger population, value added features provided by the shock wave therapy devices, and increase in stimulation of cell proliferation, tissue regeneration, and angiogenesis have contributed to the prominent share of the segments. In terms of modality, the shock wave therapy device market is segmented into portable shock wave devices and fixed shock wave devices. Based on end-user, the global market is segmented into hospitals, clinics, rehab centers, and others. Geographically, the global shock wave therapy device market is segmented into North America, Europe, Asia Pacific, Latin America, and Middle East & Africa. North America dominated the global market; however, it is projected to lose share by the end of 2025. The market in North America is primarily driven by rapidly increasing geriatric population, high adoption of shock wave therapy for pain management, and growing incidence of kidney stones and erectile dysfunction in the U.S. Moreover, increase in low-intensity extracorporeal shockwave therapy mechanisms practices in the U.S. is projected to fuel the radial or ballistic shock wave generation segment in the country during the forecast period. The shock wave therapy device market in Asia Pacific is projected to expand at a rapid pace during the forecast period. Japan dominated the shock wave therapy device market in Asia Pacific. The market in China is estimated to expand at an exponential CAGR during the forecast period. Companies such as EMS Electro Medical Systems S.A., BTL Corporate, Dornier MedTech GmbH, and Zimmer MedizinSysteme GmbH are major players operating in the global shock wave therapy device market. Other global players include Siemens AG, Boston Scientific Corporation, ?NCELER MEDICAL LTD, Guangzhou Longest Science & Technology Co. These companies engage in strategic acquisition and collaboration with other companies to improve and strengthen their geographic presence in the international market. This report on the shock wave therapy device market analyzes the current and future scenario of the global market. Large number of bone injury patients and geriatric kidney stone patients are increasing the usage of shock wave therapy device. Less pain and high-definition healing technology are the major drivers of the global shock wave therapy device market. The shock wave therapy device market report comprises an elaborate executive summary, which includes market snapshot that provides information about various segments of the market. It also provides information and data analysis of the global market with respect to the segments based on modality, technology, application, end-user, and geography. A detailed qualitative analysis of drivers and restraints of the market and opportunities has been provided in the market overview section. Additionally, the section comprises major player’s product portfolio-based on technology & application to understand the competitive landscape in the market. This section of the report also provides market attractiveness analysis, by geography and market share analysis by key players, thus presenting a thorough analysis of the overall competitive scenario in the global shock wave therapy device market. Based on technology, the market has been segmented into focused shock wave generation, radial or ballistic shock wave generation, and combined shock wave generation. The focused shock wave generation segment is further divided into electromagnetic shock wave generation (EMSG), electrohydraulic shock wave generation (EHSG), and piezoelectric shock wave generation (PSG). The technology segment has been analyzed based on available approved products, cost-effectiveness, and preference for technologies by physicians and patients. The market size and forecast for each of these segments has been provided for the period from 2015 to 2025, along with their respective CAGRs for the forecast period from 2017 to 2025, considering 2016 as the base year. Based on end-user, the shock wave therapy device market has been segmented into four major categories: hospitals, clinics, rehab centers, and others. The shock wave therapy device are also segmented into portable shock wave device and fixed shock wave device based on the modality. The market segments has been extensively analyzed based on prevalence of diseases, available treatment, and geographical coverage. The market size and forecast in terms of US$ Mn for each segment have been provided for the period from 2015 to 2025. The report also provides the compound annual growth rate (CAGR %) for each market segment for the forecast period from 2017 to 2025, considering 2016 as the base year. Geographically, the global shock wave therapy device market has been categorized into five major regions and key countries in the respective region: North America (the U.S., Canada), Europe (the U.K., Germany, Russia, France, Spain, Italy, Russia, and Rest of Europe), Asia Pacific (Japan, India, China, Australia & New Zealand, and Rest of Asia Pacific), Latin America (Brazil, Mexico, and Rest of Latin America) and Middle East & Africa (South Africa, GCC countries, Israel, and Rest of Middle East & Africa). The market size and forecast for each of these regions and the mentioned countries have been provided for the period from 2015 to 2025, along with their respective CAGRs for the forecast period from 2017 to 2025, considering 2016 as the base year. The research study also covers the competitive scenario in these regions. The report also profiles major players in the global shock wave therapy device market based on various attributes such as company overview, financial overview, product portfolio, business strategies, and recent developments. Major players profiled in this report include EMS Electro Medical Systems S.A., BTL corporate, Dornier MedTech GmbH, Zimmer MedizinSysteme GmbH., Siemens AG, Boston Scientific Corporation, ?NCELER MEDICAL LTD, and Guangzhou Longest Science & Technology Co.